I spent the weekend in Los Angeles at Indiecade, an annual event that celebrates independent games of all sorts, from PC and console games to games where you put on costumes and pretend to be witches. Here are the coolest ones I got to play this year. The Black Widow is a murder mystery where you use a spirit board to communicate with dead people. At Indiecade, I got to play it with an actual, physical board, but a mouse and keyboard will work fine as well. The mystery is rooted in authentic history and centers around Australia’s first female serial killer. You listen to anecdotes and testimonials that are based on real court records and pick out keywords, which you then input to hear more anecdotes and testimonials about specific subjects. At the end of it all, you decide whether this woman was guilty-as-charged or unjustly executed. “Was the accused a callous adulteress, drunkard and liar, or a victim of sexist expectations?” the game’s developer asked. It’s quite a question. Good luck answering it. There aren’t enough games that let you play as a dog, so Phogs lets you play as two dogs sharing one body. It’s a co-op game, but you only use one controller, with each player being responsible for the thumb stick and shoulder buttons of half of the game pad. Your cat-free catdog can stretch to obscene lengths, wrap around things, and grab objects with its mouths. You use these abilities to solve puzzles that might involve, for example, having one player grip onto a surface while the other swings and latches onto a further-away surface. A friend and I also managed to corral a bunch of cute creatures who were impeding our ability to solve a puzzle and fling them off a cliff, but I’m not sure you’re supposed to be able to do that. We laughed the whole time. Herald fits the mold of a point-and-click adventure, but the story it tells and the way it tells it are unique. It’s set in an alternate version of the 19th century and focuses on Devan Rensburg, a steward aboard a ship called the HLV Herald. Devan is a young man of mixed heritage who was raised in a fictional Western superpower called the Protectorate, but he’s hoping to uncover his roots in India. 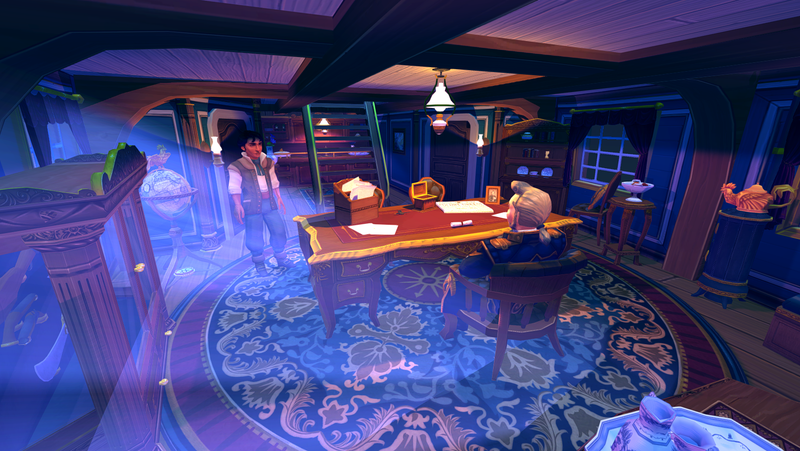 The game’s story focuses on Devan’s life at sea, as well as themes of inequality, injustice, and other forms of social strife. The presentation exudes a quiet confidence, with art and voice acting that’d seem at home in games made by much larger teams. You can actually play the first two episodes of Herald right now on Steam. Disco Bear made me think I was losing my mind. Described as “the heartfelt story of a bear being asked to dance again,” it’s basically a surrealist art collage you dance your way through. If you want an example of how strange it is, one of your “dance moves” involves transforming into a bear rug, implying that you’re suddenly dead and taxidermied. Disco Bear is brief but very funny, and occasionally oddly affecting. You can play it here. Feast is probably the most unique game I played at Indiecade. Unlike the others I’ve written about here, it doesn’t have a video or electronic component. Technically, you can play it right now. The basic idea is that you and some friends put together a “feast” of foods from each of the main flavor categories: salty, sweet, sour, bitter, and umami. Each player then devises a character. The game is comprised of five turns, and each turn sees players try a dish. Based on the properties of the dish, they imagine a memory that their character had. One turn might be a memory your character has never told anybody about, for example. Another might be a regret. The twist? You’re not playing as your characters. “You” are an alien devouring your character’s memories. Each bite you take is what that particular memory tastes like to you. Feast, then, is a game about creating a character and destroying them simultaneously. It’s also got more serious underpinnings than its goofy twist might imply, exploring power dynamics and erasure of culture by people in power. At the end of it all, your characters are memory-less husks, but at least you’re not hungry anymore.